Bracken fern (Pteridium aquilinum) is a conspicuous, deciduous, perennial fern that is commonly found worldwide. In fact, it has been said to be the fifth most distributed common weed species of the world. Bracken fern reproduces by spores and forms branched underground stems, sometimes forming colonies. 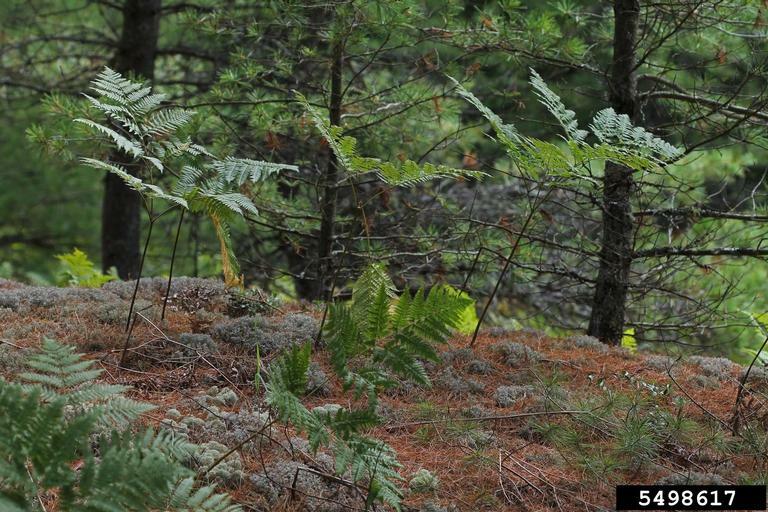 Bracken fern colonies are usually found on hillsides at the edge of woodlands and thickets in partial shade. 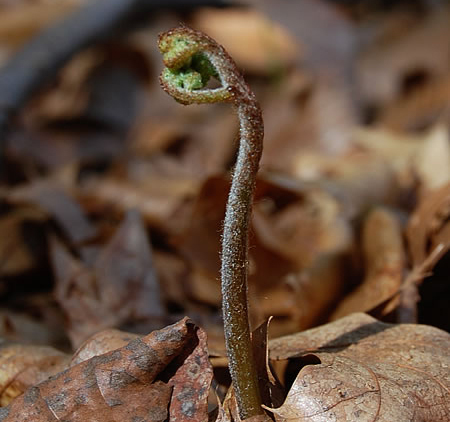 Up to 30 million spores may be produced by a single frond, and spore production tends to be greater in open habitats. Spores may remain viable for up to 10 years in soil. Bracken fern are also for the most part, fire-resistant, as the rhizomes send up new shoots after the old ones are burnt. 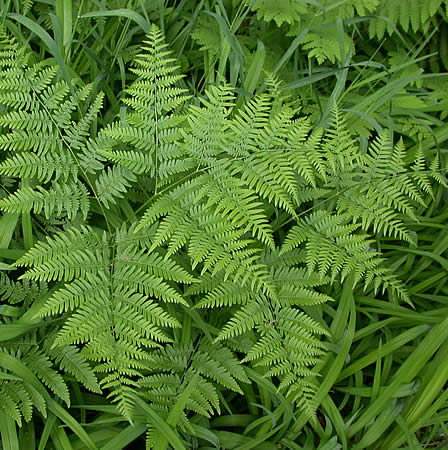 Bracken fern contains several different poisonous and carcinogenic compounds, including thiaminase, cyanogen glycosides, and ptaquiloside. However, the principal toxin is thiaminase. Thiaminase is an enzyme responsible breaking down thiamin, an essential B vitamin that's needed for proper functioning of the horse’s central nervous system. If horses ingest large quantities of thiaminase, it inhibits absorption of these essential B vitamins, resulting in vitamin B1 deficiency. Depending on the severity of the deficiency, without prompt treatment, it can be lethal to the horse. Although horses are at risk grazing in fields that contain bracken fern, many cases of poisonings have occurred in horses due to unknowingly consuming hay that was contaminated with dried bracken fern. If horses consume hay containing 20% of bracken fern parts over a time period of 30 days, it can cause them to develop clinical signs of vitamin B1 deficiency, or bracken fern poisoning. 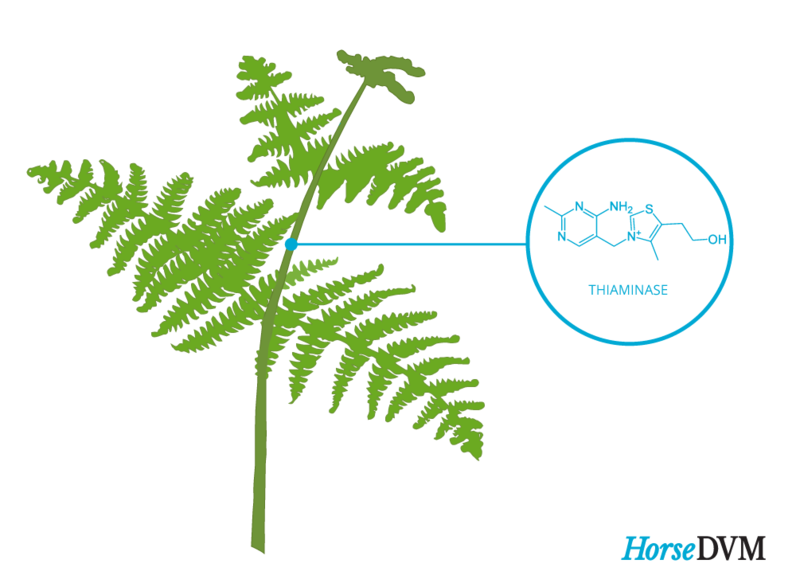 For the average 454-kg (1,000-lb) horse, 1-2 kg (2.2-4.5 lb) of bracken fern would cause toxicity signs. Bracken fern also tends to be somewhat palatable to horses. 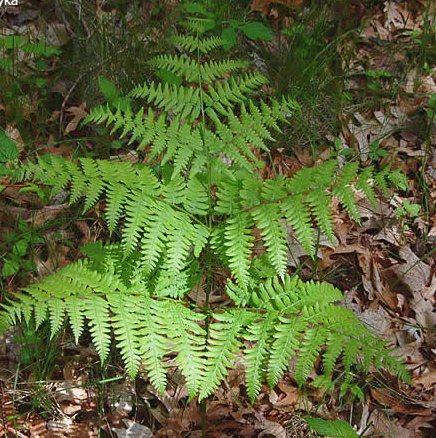 Due to the plant's rhizomatous rooting system and its ability to quickly produce mass amounts of spores, controlling bracken fern can be difficult. CULTURAL CONTROL: Reseeding with preferable forage grasses or herbaceous species can help reduce infestations. MECHANICAL CONTROL: Bracken fern is difficult to control, but in small areas, persistent hand tugging to remove emerging fronds or crush new growth while its still soft and tender could help progressively weaken and eradicate it. 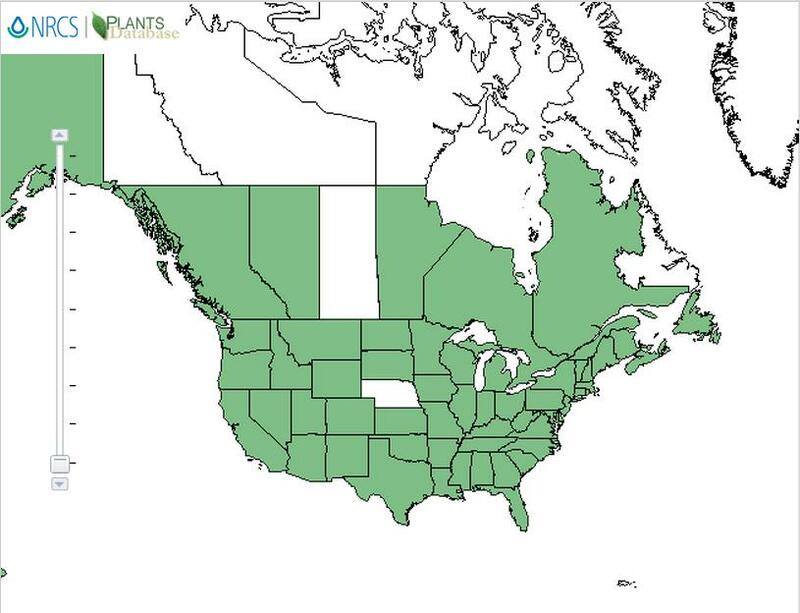 In larger infested areas, making two cuts per year for at least three years might weaken the plant. 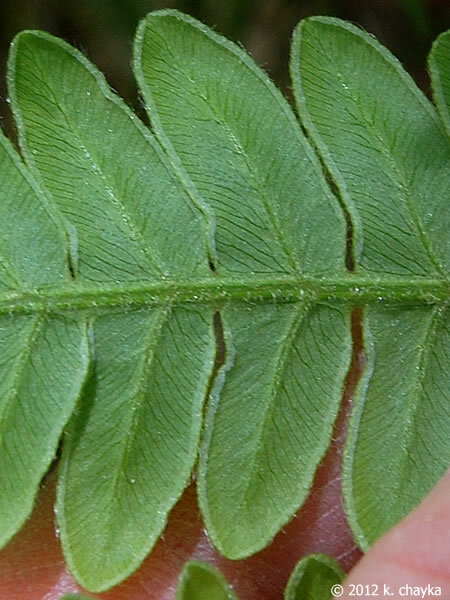 CHEMICAL CONTROL: Bracken fern can be effectively controlled using 2qt per acre of 2,4-D, 24oz per acre of 2,4-D + aminopyralid, 1qt per acre of Triclopyr ester, 1.5qt per acre of Triclopyr + fluroxypyr, 1.5qt per acre of 2,4-D + dicamba, 0.3oz per acre of Metsulfuron, or 0.5oz per acre of Chlorsulfuron. Bracken fern should be undisturbed for 12 months prior to spraying because it is the mature fronds that transport herbicide down to the roots to control dormant root buds. 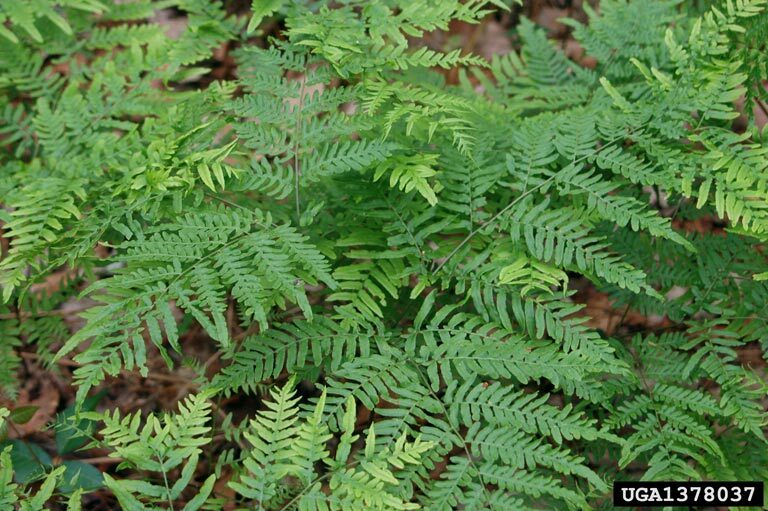 USDA SPECIES: Pteridium aquilinum Fire Effects Information System. 2018. USDA estern Bracken Fern (Pteridium aquilinum) Poisonous Plant Research Database. 2018. Center for Aquatic and Invasive Plants Pteridium aquilinum var. pseudocaudatum University of Florida, IFAS. 2015. D Giblin Pteridium aquilinum Burke Museum of Natural History and Culture. 2015. Bracken Fern Control in Pastures University of Florida. 2011. 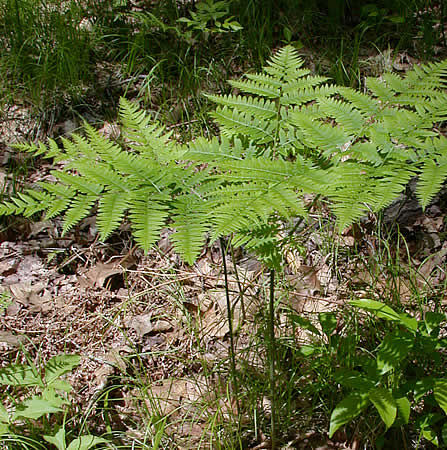 A biological hazard of our age: bracken fern [Pteridium aquilinum (L.) Kuhn]--a review Acta Vet Hungarica. 2009.